After months with iPhoto on my computer, I visited Apple last weekend for a 30 minute appointment to find out how it actually works. Okay, I should have figured it out myself. But with just that brief tutorial behind me, I thought it would be fun to show you what a rank amateur can do to change a photograph to make it better than the original. It isn’t rocket science that I should never take a photograph through my car window. But the roads were really muddy and there was a car coming up behind me. So I just stopped the car, quickly took this shot, and moved my car before the driver behind me reached the bridge. Nothing magical about the changes, but every step toward better photographs is a step in the right direction. 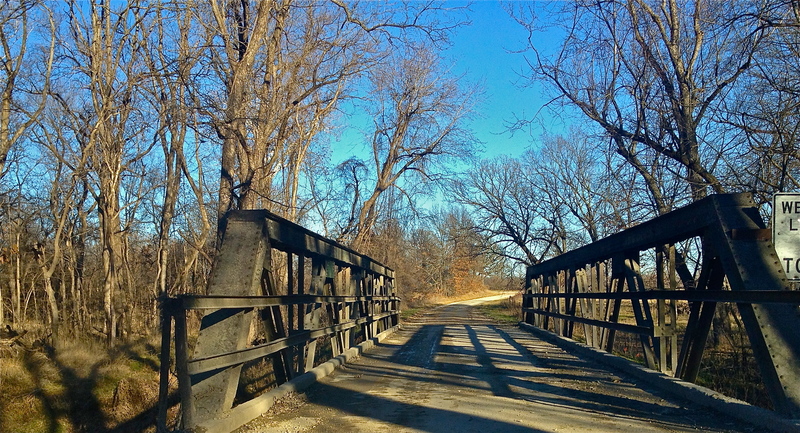 This entry was posted in Photography and tagged Bridge, country, Driving Rural Missouri, Harrisonville, iPhoto, Photography, Rural Missouri. Bookmark the permalink. The first shot looked good to me, but you’re right. The third one is gorgeous! You do such cool things, Ann. I am learning slowly. But learning slowly is better than not learning. So, thanks.